Persuant to the objectives of the Association grants have been made to archaeological projects, excavations and research projects. Support has included grants, equipment, professional testing fees, accommodation, and AAA volunteers. In recent years we have also provided support to students. The geological and geomorphological formations in southwestern (SW) region of Algarve (Barlavento),characterized by karstic features, such as natural caves and shelters, have long been seen as an attractive ecological and geological landscape to early human occupation during the Pleistocene. In fact, during the last decades archaeological investigation in this region has shown that human populations occupied this territory during the Paleolithic and Mesolithic. Although diverse archaeological finds have been reported, to date not a single project has been systematically focused on the inventory of the coastal, including marine and terrestrial, karst formations and its speleological and archaeological potential. Although preliminary work has been carried out, published speleological data from the Algarve context is still scarce and dispersed and this specific line of research has been poorly developed. This situation leads to increased vulnerability of this natural heritage facing human pressure and no clear understanding of the archaeological potential of the region. primarily on Late Pleistocene horizons. The presented project, combining terrestrial (i.e. shore) and underwater archaeological work, such as survey, test pits and excavation, will be focused in one of the main interesting areas in Algarve from a geological and archaeological point of view. 5th Iberian Peninsular Archaeomalacology Scientific Conference (RCAPI). The RCAPI group was inaugurated in 2010 and through its conferences gives researchers in prehistory, history, zooarchaeology, archaeology, biology etc the opportunity to meet together to exchange information and data. From 26 - 29 April 2017 their conference will be held for the first time here in Portugal at the University of Faro. Next years conference will be focusing on Iberian zooarchaeological (EZI) research. The AAA has committed to a grant for the printing of the Programme and Abstract Book (in English). Other funding for this event is being sought from a variety of institutions and organisations. As last year students have been awarded grants to assist them travel to conferences to present their work. This year 3 grants have been approved. Rescue Excavations at Boca do Rio. In July Prof. Joao Bernardes (UALG) has directed excavations on the cliffs next to the Roman site at Boca do Rio. Over the years the cliff has been eroded and also due to weathering and human walking traffic, a number of Roman graves have come under threat. The AAA has given financial support to this project which has run for two weeks. Assistance was also being provided by Vila do Bispo council and an anthropologist from Coimbra. The AAA has been working together with NAP, a student driven organization in the faculty of Archaeological of Faro University with the aim to support Students of Archaeology who want to present a poster or a talk at a scientific meeting. We have supported 7 students to present their work in Belgrado, Barcelona, Freiburg, and Lisbon. Furthermore a grant has been given to Jorge Freire to present his maritime archaeological project in the US. The AAA has also given a grant to Felix Teichner for his geophysical surveys of several sites in the Algarve. The AAA has given a grant to Dennis Graen (University of Jena) to assist in his work at the Roman villa site at Cortes near Silves. The AAA made a visits there in 2013 and 2014. Dennis Graen has also presented his work to the AAA in October. Ismael Medeiros who had been the recipient of a student grant by the AAA in the past is now supported in his involvement with the cartography of archaeological sites and findings in the concelho of Vila do Bispo. Tiago Fraga has been given a grant to continue the Project Patacho Pedro Dias in Baleira Bay (Martinhal). The first goal is to pinpoint more shipwrecks and artefacts by remote sensing. After which they will try to excavate and register all of the targets and with this year’s grant he will be able to start his diving in July. Tiago reports that last year’s campaign (helped by 2012 AAA funding) was a success resulting in 35 different targets to study of which they were able to verify 5. One of them is a shipwreck composed of several machinery pieces including possible flywheels and multiple iron shafts. Charred wood was also discovered at the site. A few copper alloy fasteners and an iron ‘knee’ were also found, indicative of late 19thC ship building. An archaeological site plan for this wreck site is in progress. Tiago reports that this has now grown into a substantial project and has got the attention of the research community, both domestic and abroad, which is excellent news. They now know of the location of three of the known eight wrecks and believe they have not even ‘scratched the surface’. All have a story to tell, deeds of smuggling, adventuring, piracy, trade await, but all are also of a bigger story, in the words of Donny Hamilton ships where ‘vectors of cultural interactions and maritime peoples the de-facto ambassadors of cultural and technical diffusion’, all giving their small contribution to the rich history of humankind. Joana Baço, whose research the AAA is helping to fund, has begun her diving and survey programme in the Bay of Lagos. The main Projecto de Carta Arqueológica Subaquática do Concelho de Lagos (PCASCL) aims to locate, identify and protect existing underwater heritage with in the district’s coastal area. The project is also being supported by private donations and is the result of the good will of a group of Lagos residents who took it upon themselves to continue the investigations in the bay after the abrupt end of a previous project. The Bay of Lagos, one of the largest in Portugal, was the centre of a long period of maritime trade, the wrecked remains of which still lie on the seabed – lead and iron anchors, stone ballast, hull timbers and iron fittings, ropes and pulleys. The project’s first stage is Joana’s in-depth study of the anchors known to date and also to work to identify their origin and on what kind of vessel they were used. – smuggling activities, trade or fishing practices for example. Joana will be presenting a paper on the initial finds in November at the 1st Congress of the Association of Portuguese Archaeologists in Lisbon and the paper is likely to be published in their proceedings. Ana Osório – has been funded to set up and run a series of field workshops entitled ‘You make, I break, we glue - Ethnography and experimental insights into pottery interpretation’. The workshops took place in April and May and were held at the Institute of Archaeology, (Coimbra). They were attended by 2nd and 3rd year BA archaeology students and also 1st year MA students. The students worked on basic pottery techniques using clays from the soils around the Beja and Badajoz areas. This was then followed by session on the methods of firing of this handmade pottery and tests were carried out using a variety of ‘kilns’ and fires at different temperatures. The results were then compared. The final workshop looked at how suitable the fired pots were for subsequent use ie water/food and for cooking bearing in mind the pottery had not been glazed. The amount of water retention in the fired pots would of course depend on the temperatures at which the pots had been fired. A number of organic materials were used to try to reduce porosity (sealing the vessels) or mending the pots that showed small cracks after firing. The materials tested were whole meal flour, wheat bran, animal fat and vegetable oil, blood and beeswax. It seems that both wax and whole meal flour produced good results not only in reducing porosity and allowing water to boil but also in mending vessels. Alexandra Gradim : During the summer she has continued the excavation at the late republican settlement on the Castelinho dos Mouros. 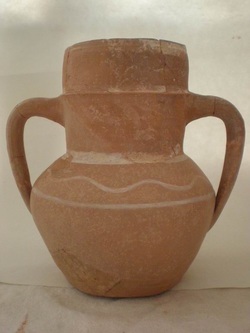 An amphora was found with still some residues in them. The AAA is funding the analysis of the ceramic and residues which are performed at the University of Evora. Elena Moran : As part of her PhD thesis on Alcalar she is making a comprehensive study of the territory's settlement in the 3rd millenium BC. Last year the analysis of the faunal remains was supported by the AAA. The current part of her study involves the study of seeds and cereal grains (paleoethnobotanical remains) recovered in the storage pits, ditch, and house related layers of the copper age settlement. The AAA is supporting the archeobotanic analysis of the samples. This year we have sponsored 3 students from the Archaeology Faculty of the Faro University in order to cover their expenses for field work/ research to be done for their final thesis. 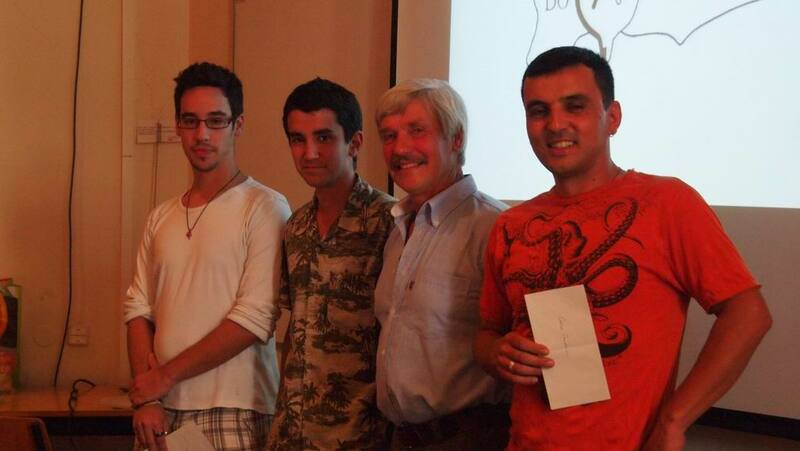 Following a presentation about the AAA to the archaeology students in general the prizes were awarded to the 3 qualifying students by the AAA president at that time Florian Fuhrmann. Elena Morán - Grant for the study of the faunal (mammal) remains recovered from Alcalar. In March this year Alexandra Gradim presented a lecture about the archaeology in the province of Alcoutim. In June Alexandra guided a group of AAA members to the various sites (see trip report of 2011-June). This summer she will continue excavating at the site of Castelinho dos Mouros with the help of foreign students and AAA volunteers. The AAA supported Alexandra with the funds to buy a camera suitable for her archaeological work. We gave a grant to 2 students from Luiz Oosterbeek. The research center of the IPT is based in the Museum of Prehistoric Art of Mação, and is primarily concerned with transition periods (first human settlements in Portugal, transition from the Lower to the Middle Paleolithic, transition into the Holocene and the dawn of agriculture). Technology and Rock Art, and in general the relations between technology and symbolism in human adaptation mechanisms, are the focus of concern. Finally, heritage management is also a major research line in the group. The project on rock art is interested in understanding the cultural relation between the rock art evidences in the Tagus basin and the overall socio-economic trends in the transition into food production. The main activity is to draw the more than 2000 latex casts, made in the early 1970’s, on rocks with thousands of engravings, now under the water reservoir of the Fratel dam. Systematic analysis of the casts has never been done. Now, almost 40 years later, this tracing work is crucial to produce new knowledge and a comprehensive understanding of the art complex. Both from a scientific-historic and patrimonial perspective, this is a major project. The archaeological problem is the difficulty to relate rock art sites and other prehistoric sites, since direct relations are very rare. A new approach to the available casts, together with the new surveys, looks primarily at engravings stratigraphy and distribution patterns (these being articulated with the settlement patterns that were already identified). Thanks to the work Sara was able to show she subsequently won a research scholarship from the FCT (fund for science and technology) to continue her studies on the rock art of the Tagus River. Cristiana Ferreira : The project on environmental changes is another major and innovative project. For long, the indicators of environmental degradation (fires, replacement of forest by shrub vegetation) have been associated with the first farmers (that, using the slash and burn method, presented by Gordon Childe as the dominant agricultural method in these early times, would contribute to the loss of productivity of the soils). Research of the IPT a few years ago identified indicators of degradation before 6.000 BC, i.e., before the first farming activities. In the last year and a half any indicators of vegetation degradation in the Tagus basin and in Iberia, prior to 5000 BC. has been looked at in detail. More and more evidence is found that a natural, rather than anthropic, process may be in place. Main arguments in favour are: the absence of a deep ice cover in the Pleistocene (that helped producing the loess highly productive soils of central and northern Europe); the latitude of Iberia, that tended to anticipate the effects of the Holocene climatic changes, thus arriving earlier than in the northern territories to the so-called telocratic (decay) phase of the environmental natural evolution; the knowledge of dry episodes in the Holocene, namely around 6600 BC and 5600 BC (that could have accelerated an impoverishment of the soils and, as a consequence, may have had an influence in the decision of human groups to become farmers). Arguments that refrain this are, mainly, the absence of undisputed evidence and the absence of well dated palynological contexts. The IPT has hence engaged such a project, looking simultaneously to the climate and the environment. Since 2006, archaeologists are studying the best harbour of the Algarve for some of the rich naval history of Portugal and the world. Our goal is to understand the amazing technology humans have created to survive in one of the most hostile environments Earth has to offer us and to understand the maritime culture’s level of participation on the shaping of the modern world. George Bass states “Long before there were farmers there were sailors”. Sailors have with their blood and lives built the world. As they explored, traded, fought and died they were carriers of news, of ideas, of new foods and of new technology. Sailors proved that the world was round, they linked earth’s continents, they were the first line of defence for several countries, and they were responsible for the economic prosperity that brought our society to today’s advancement. Even today most of the bulk traffic of the world is under the tender care of sailors. However, because sailors have very little participation on “land life” they have always been seen as second class citizens, and have been neglected in mankind’s tale. In the present time, scientists are trying to understand how did this culture impacts history, how did their technology evolve and what was the extent of their participation on humankind's development. Not only to repair a past injustice, but also to plan for a better future. Our contribution to this study comes from understanding the maritime aspects of Lagos and at the same time to find and study shipwrecks that fill the gaps of our current knowledge of shipbuilding. Tiago has given several lectures to the AAA about maritime archaeology. May 2008: Investigation into the wreck of the Santo António de Tanná in Mombasa Harbour. Dec 2010 : Diving in the bay of Lagos (about his project). Serious scientific work can only begin after students are sufficiently trained in working underwater and in using the equipment. Tiago was given a grant to train 9 students in maritime archaeology during the summer.